Each event on our Schedule Page includes an interactive map that will assist with directions to The Gospel Barn in Hillsdale, Michigan. However, below are some brief directions coming from various directions with the most direct route. Take US 127 south to US 12 west to M 49 south. 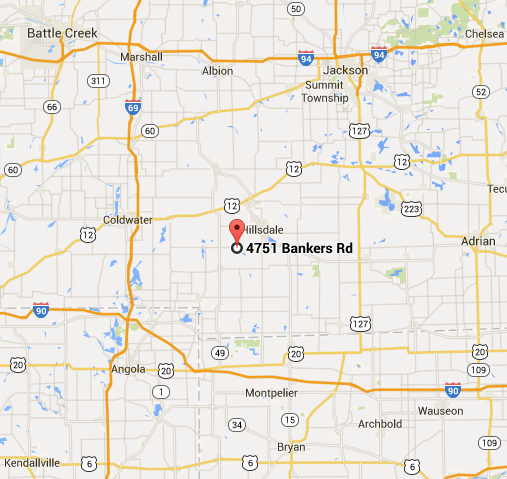 Once on M 49, go about 5 miles to Bankers Road and take it left. The Gospel Barn will be 2.5 miles on the right. Take M 49 north through Camden and Reading, Michigan. About 2 miles north of Reading you will come to Bankers Road and take it right. The Gospel Barn will be 2.5 miles on the right. Take US 12 east to M 49 south. Once on M 49, go about 5 miles to Bankers Road and take it left. The Gospel Barn will be 2.5 miles on the right. Take M 34 west to M 99 north. Take Hallett Street to your left (follow the blue Hospital sign) all the way out of town. About 2 miles out of town you will come to Bunn Road. Turn left. Bunn Road becomes Bankers Road in 1 mile. Stay on Bankers Road and The Gospel Barn will be on your right in about 1.5 miles.